Letter C week was Crazy! The students learned all about cooking and definitely enjoyed eating the food they cooked! On Monday, the students started off the week by working on their letter identification tracing and coloring pages. They also practiced making the sounds of the letters in the different pictures on their pages. Later on in the afternoon, the teachers led a discussion about cooking with recipes. 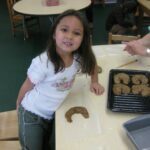 After learning different recipe vocabulary, the students had to follow a recipe to make a few batches of playdough for the classroom! Using the large picture recipe, the students counted out how much of each ingredient was needed and added it to the bowl. 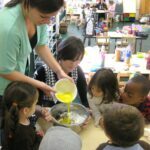 The students could hardly believe that all of those different ingredients came together to make the same playdough that they mold all the time. On Tuesday, the students continued to work on their letter C tracing and coloring pages. They also went on a letter C Hunt where they had to locate all of the letter C’s in the classroom! Later in the afternoon, Miss Saily and Miss Genie led Spanish class where the students reviewed los numeros (1-5) and even learned a letter C word – Cat or Gato. The students took turns counting gatos before heading home for the day. It was muy divertido! On Wednesday, the students made their very own aprons or “Chef Clothing” on letter C week. 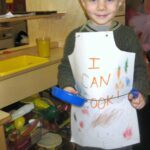 Using crayons, the students designed their own personal apron to help keep clean while cooking on letter C week! The aprons turned out great and the students were more than happy to head to the play kitchen and start putting them to good use! In the afternoon, the students continued counting gatos and also listened to a classroom favorite by Eric Carle, 10 Patitos de Goma, or 10 Little Rubber Ducks in English. Seeing that this is a story the students love, they were so excited to hear it in their new favorite language! There is a little sound piece on the last page of the story that makes a rubber duck squeak sound. Just for fun, the teachers asked the students if the duck squeak would sound different in Spanish than it would in English. After a few seconds, the students decided that it was way too silly and that Spanish ducks sound the same as English ducks. Turns out, the squeak was the same in both books. The students were right. On Thursday, the students got to try their hand at real cooking! Using a few ingredients, the students made their very own mini-pizza! 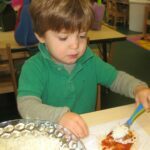 With some shredded cheese, pizza sauce, and half of an English muffin, the students followed the recipe directions exactly. The teachers even threw in a super silly direction “Add three pretzels as a topping on your pizza”. Some of the students followed the direction while others picked up on the joke and said, “What? 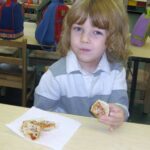 Pretzels don’t go on top of pizza!” Either way, regular pizza or pretzel pizza, the students enjoyed their snack – especially after they were heated up a bit! One student said the pizza was so enjoyable and offered to share a slice with the teachers. On Thursday afternoon, the students had a chance to make up their own super silly recipe. The rules were the students had to think of possible ingredients that would fit into the directions of the recipe but they couldn’t know what the recipe was really for! After the blanks had been filled, the students learned that their recipe was for “Crazy Cupcakes” and from how this recipe turned out they sure were crazy. The first recipe had some standard ingredients such as eggs and flour. The second recipe was a little less traditional – it was for YUCKY Cupcakes! 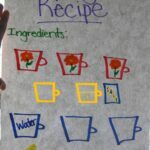 Here is the recipe as designed by the students. WARNING: DO NOT TRY THESE AT HOME!!! In a large bowl, add one cup of ___mud___. Then crack three ___eyeballs___and mix together. Take two spoonfuls of ___worms___ and then one scoop of ___lobster___. Add one handful of ___robots___. Stir ___really, really fast___! Bake in the oven for ___305___. minutes. Let cool, then serve. Enjoy! 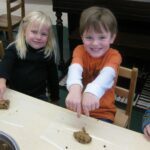 On Friday, the students actually got to make cookies. Of course, they didn’t use the crazy recipe from the day before! 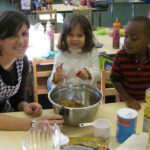 The teacher borrowed a recipe from one of the students with an egg allergy to make cookies without eggs! The teachers led a discussion about allergies and how foods can affect people differently. The cookie recipe had a lot of ingredients so it took the whole class to help make them! 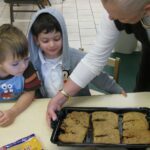 Each student scooped out two cookies-worth of dough and rolled it into a long snake. Then the students moved the dough and shaped it into the shape of the letter C and pressed it onto the sheet. The teachers placed the C cookies in the oven and by the time rest time was over, the cookies were cooked! The cookies were delicious and thoroughly enjoyed in the afternoon! 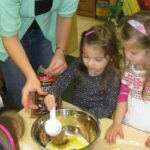 Be sure to visit the Cooking for Letter C Week photo gallery to see the students in action. Have a great and safe weekend! See you next week!